Damon Hill wasn't the first son of a Formula 1 driver who followed in his father's footsteps. Think about David and Gary Brabham who weren't as successful as their father Jack but tried anyway. There's Tim Parnell who made a few attempts but could never really cut it, while his father was the first British driver to finish on the podium in the World Championship, arriving third in the 1950 British GP. And how about Teddy and André Pilette? Neither would Damon be the last. Michael Andretti sniffed at it but failed to make his breakthrough. Or new boy Nico Rosberg, driving for the team that made his father the 1982 World Champion. But undoubtedly the best known examples are Jacques Villeneuve, son of the great Gilles Villeneuve, and Damon Hill, son of double World Champion Graham Hill. Will we ever see something of a third generation, like Joshua Hill, in F1? To set things straight right away, Damon and Graham are not related to American Phil Hill, who was the first Hill to take the title. Curiously enough, both Hill Sr and Hill Jr's career starts were not that different. Hill Sr sat behind a wheel of a car for the very first time at the age of 24, and started his career from scratch, just like his son would, albeit for other reasons. Graham made his F1 debut at the age of 29 while Damon drove his first race – on a motorbike – when he was 21 years old and made his F1 debut at the age of 32! It made him one of the oldest debutants in modern Formula 1. Jacques Villeneuve and Damon Hill are the two sons-of that took the title – once. More than once, sons of former World Champions tried to make a breakthrough in Formula 1, but Damon is the only son of a World Champion who managed to perform the same feat. 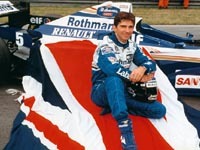 Graham was always out racing in any kind of car – not just in F1, but also in F2, sports cars and touring cars. That meant that Damon didn’t see his father all too much. Then Hill Sr got himself killed on September 29th, 1975, in a freaky airplane accident on a return trip from France to the UK. Being without any insurance for himself or his family he left Bette and their children in a difficult situation. Many claims followed. Bette had to sell their estate at Lyndhurst and got used to living in an ordinary house. So, when Damon decided he wanted to be a racing driver, he had a big problem: money. So, just like his father, Damon had to start from absolute scratch – when he was fifteen years old he drove around on a moped selling everything he could get his hands on, just to make some money to race. In 1981, Damon married his childhood friend Georgie, who gave birth to their first-born Oliver in 1989. But Oliver turned their lives upside down, since he suffered from Down syndrome. In 1991, Georgie gave birth to another son, Joshua, and daughter Tabitha followed later. Most of today's Formula 1 drivers started their careers driving go-karts from a very early age but Damon didn't drive or ride anything until he was 11 years old, when his father allowed him to ride his 50cc Honda moped in the paddock in Silverstone. A few years later Damon rode his father's 350cc Bulcato cross motorbike, and that is when Hill Jr got caught by the racing bug. Hill Jr's career really took off in 1981. He earned money by making deliveries for a local bakery, and in weekends raced his Kawasaki. He was on a tight schedule, and had little energy left for racing. In 1984 he had to focus his efforts on one circuit, due to his lack of funds. He chose Brands Hatch, and won over 40 races there... After that, he switched to cars and started racing in Formula Ford 1600. And soon enough, that very year, he claimed his first car-racing victory, at Brands Hatch of course. Halfway into 1984 he was declared Rookie of the Year and one year later he got his hands on a full season of Formula Ford. In 1986, Damon stepped up to F3, driving for the Murray Taylor Racing team in the Lucas British F3 Championship. He also won the Rally-Sprint, finishing ahead of rally legend Stig Blomqvist and F1 drivers Derek Warwick and Johnny Dumfries. He continued in F3 in 1987, racing for Intersport and taking fifth overall in the championship. He went even better in 1988, finishing third in the championship, and making his F3000 debut, taking part in two races for GA Motorsport. Continuing in F3000 in 1989 he started six times and finishing three times, none of them in a points-scoring position. He also took part a single BTCC race. There was enormous improvement in 1990 when he took three pole positions, two fastest laps and a second place in F3000 – at Brands Hatch, of course. But while his form had improved dramatically, his luck hadn't. His second place at Brands was the only time he finished in the points, so he finished the season 13th overall with just six points. With seven points, one third place, and eleventh in the championship his results in the following season didn't improve much. The first time Hill drove a Formula 1 car was during a Benetton test in 1988 when at Paul Ricard he drove the Benetton-Ford B188 turbo. But in 1991 he got his major breakthrough. He was asked by Frank Williams to be the test driver for his team, replacing Mark Blundell. With Williams being the best team at the moment, Hill did not hesitate and took the job. In 1992, Williams allowed Hill to drive for the Brabham team when Giovanna Amati was let go after she failed to prequalify three times. Initially, Hill didn't do much better: he failed to qualify for his first five attempts. The team that had been produced World Champions in the sixties and eighties didn't have much left of its former pride. Hill became team-mate to highly talented Belgian Eric van de Poele and only managed to qualify twice, racing at Silverstone and at the Hungaroring. So Hill was now a Grand Prix driver, managing to finish his first two GPs, but he wanted to be in the Williams that he had helped develop into the all-conquering race winner that was lapping him several times in one race. After the Hungarian GP Hill wouldn't have to bother anymore as the Brabham team seized to exist. Damon again put his full attention into testing and developing the car that allowed Nigel Mansell to finally take his title. 1997 was not the season that Hill had hoped for. Looking back at it, it all makes sense. The Arrows-Yamaha didn't look that bad, but a beautiful car doesn't always mean it's quick. And it wasn't. Hill almost missed the first race of the year, almost failing to set a time within 107% of the pole time by his former team-mate Villeneuve. And to add insult to injury he didn't start the race anyway because of a broken throttle cable before he even made it to the grid! It was a quick end to his aspirations of successfully defending his title. Hill suffered from an undriveble car that broke down most of the time, and soon he lost his joy in driving. That made him even slower, and the fact that the not-so-talented Pedro Diniz was quicker then the World Champion didn't help either. Arrows owner Tom Walkinshaw even went as far as to state the following at Silverstone: “Hill is highly unmotivated. He can't even cope with the speed that Diniz is showing.” Secretly, Jorg Müller, official Arrows test driver, was hoping to make his official F1 debut. That was until Hill took sixth at Silverstone and went on to cause a shock in Hungary. Hill qualified an amazing third, and for his many fans it will be hard to forget that particular race. Hill soon took over the lead from Schumacher and Villeneuve, who were both fighting for the championship, but Hill was quicker than everybody else. It was sensational and everybody was certain that Hill was going to win this one. But then his gearbox gave trouble, and on the very last lap Villeneuve passed Hill for the lead, although he needed to go on the grass to make the move stick. Hill limped home a disappointed second. In 1998 Hill changed team again, leaving Arrows for the promising yellows at Jordan. At the team presentation Damon declared that he had come to Jordan to win races again. But it wasn't meant to be. If the 198 was quicker than the Arrows it wasn't by much. In the first half of the season, Hill didn't finish six out of nine races. And if he did points never got within reach. More worryingly, young Ralf Schumacher was outpacing him most of the time. Hill finally took some points at Hockenheim by finishing fourth, and repeated that in Hungary, slowly regaining form. Then came Spa. It became the biggest sensation since the rainy Belgian GP of 1966. Hill had already qualified third, and a few spectacular crashes helped him into a lead which he never lost. Hill won the "speedboat" race and Schumacher (i.e. Ralf, because Michael crashed his Ferrari into Coulthards McLaren) took the second place. Although Hill took more points in the remaining races, Spa was undoubtedly the highpoint of the season. By now, rumours were going that Hill would end his career at Silverstone, and wave farewell at his home Grand Prix, just like his father had done. And while Hill managed to take away two points for finishing fifth many believed it would be better if Hill quit right away to save his reputation, having completely lost his motivation. To cover the event, Eddie Jordan approached Jos Verstappen to test the car and be ready to step in as soon as Hill decided to call it a day. If Hill decided against quitting, he would at least have some pressure on his shoulders. In the other case, Jordan would have his replacement ready and waiting. But Hill kept on racing, so Jos didn't get his Jordan break. Arriving at the last race of the season at Suzuka many of his fans couldn't imagine that Hill would really stop racing, showing many banners in support of him. But continuing his season's form, Hill had a disastrous race, spinning and needing a front-wing replacement. For 20 laps he was carrying the red lantern, so on lap 21 Hill decided to come in and get out. For good. To save the best for last… After his 1992 debut in his home GP, and after the Brabham team seized to exist, the cards again turned in Hill's favour. Both Riccardo Patrese and Nigel Mansell left the team and Alain Prost came to try and claim his fourth title. Frank Williams didn't have too much choice as there were only three drivers left without a seat: Martin Brundle, Mika Häkkinen and Damon Hill. Being already familiar with the Williams team Hill took the full advantage and got his seat. But he had to prove himself for he got himself a contract for the 1993 season only. Add that Prost was a very experienced campaigner and a three-times World Champion, and Hill had a tough job ahead of him. But Hill was a team member since 1991 and knew all about Williams F1, and so did the very best he could, challenging Prost whenever he could, putting him under pressure. It paid off. Hill was well in the lead at his home Grand Prix and heading for victory. He surely would have taken the flag if his engine hadn't blown up. Finally, his dream came true in Hungary, taking his maiden victory. And to make sure it wasn't accidental he also took victory at the following races at Spa-Francorchamps and Monza! Nevertheless, Prost duly took his title and left Formula 1, whereas Hill was offered to stay on the next year. Then came the race at Spa-Francorchamps, and although Hill was still way behind Schumacher in the title hunt, he got it back in sight after the race. Michael saw himself disqualified again due to an irregularity with his car: the wooden plank that was screwed to the underside the car had seen too much wear and so Schumacher was robbed from his victory, with Hill inheriting it. Schumacher also got banned for the next two races, and Damon took full advantage by winning both of them. So, in four races Hill took 40 points and Schumacher none at all. This meant that Hill had closed the gap to a single point. The fight was on for the last race. Whoever finished in front of the other would be the 1994 World Champion. So Michael took the lead but in his rush to the title went off the track and hit the wall. The German managed to get back on the tarmac, only to torpedo his Benetton into Hill's Williams, right at the moment that Hill wanted to overtake Michael. Michael almost rolled over but didn't. All Hill had to do now was finish fifth. But he couldn’t, as the impact with the Benetton had damaged his left front suspension too much. So Schumacher took this first title while Hill lost it. In 1996, his luck changed. Or did it? His main rival Schumacher had left Benetton for Ferrari and wouldn't be able to challenge for the championship because of the bad shape Ferrari were in. Coulthard left for McLaren to partner Häkkinen. His new team-mate was Jacques Villeneuve, an F1 rookie but the 1995 Indy Car champion all the same. Just like Hill he was the son of a famous former Grand Prix driver. Villeneuve proved he wasn't easy cake for Hill as the Canadian took pole for his first race and would have won if he hadn't encountered any problem. But he did, and Hill won the race. It meant a good start to the season, especially since Hill also won the next two Grands Prix. Things turned around at the Nürburgring, where Villeneuve took his first victory. Hill had a bad start and Villeneuve took full advantage. The rest of the year their form sheet went up and down, as they traded victories, with Damon still unable to shake off his team-mate in the title race. To make matters worse, Frank Williams announced at Monza that Villeneuve and Heinz-Harald Frentzen would be driving for Williams the following year. But why would Hill have to be the one to leave? Right there at Monza he was on the brink of winning the championship. But as with most other World Champions, Williams was happy to see him go after taking the title, just like it happened with Mansell and Piquet. And while Hill had the opportunity to seal his title at Monza, he retired from the lead after hitting the tyre-lined chicane. Luckily for Hill, his team-mate also failed to finish. Then, ahead of the deciding race at Suzuka, came the shock announcement that he would be driving for Arrows in 1997. It was all but a top team, a steady midfielder, yes, but not quite the team that was deserving of a reigning World Champion. But expectations were high all the same. Hill had seen the factory and was impressed by it. The fact that the Arrows would be Bridgestone-shod also helped him make the decision. And the reigning World Champion he would be, as Hill took the final pole of the 1996 season, then went on to grab the lead at the start, never to lose control over the race. With Villeneuve dropping out of the race, because of a wheel coming off, Hill was finally crowned World Champion! Oh, he won the race as well, by the way. How good was he as a driver? If you look at his results from 1997 to 1999, you could say that he lucked into his title. But of course that is overstating it. You cannot be a mediocre driver and still take the championship, not even when driving the best car in the field. So was it just a case of picking the right team – Frentzen took third in the championship in 1999 while Hill took seventh. Or was it that he needed the car to suit his style? At Williams, Hill was undoubtedly the top of the line, fighting for the championship in three successive years, only to lose it twice because of bad luck (1994) and failing strategies (1995). And what is he doing right now? These days, Hill is the new president of the British Racing Drivers Club, having taken over the mantle from Sir Jackie Stewart.